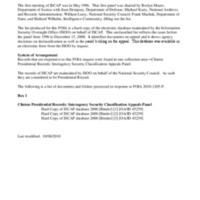 This collection consists of the list of cases before the Interagency Security Classification Appeals Panel, 1996-2000. The list produced is a hard copy of the electronic database maintained by the Information Security Oversight Office (ISOO) on behalf of ISCAP. This unclassified list reflects the cases before the panel from 1996 to December 15, 2000. It identifies documents on appeal and it shows agency decisions on declassification as well as the panel’s ruling on the appeal. This database was available in an electronic form from the ISOO by request.